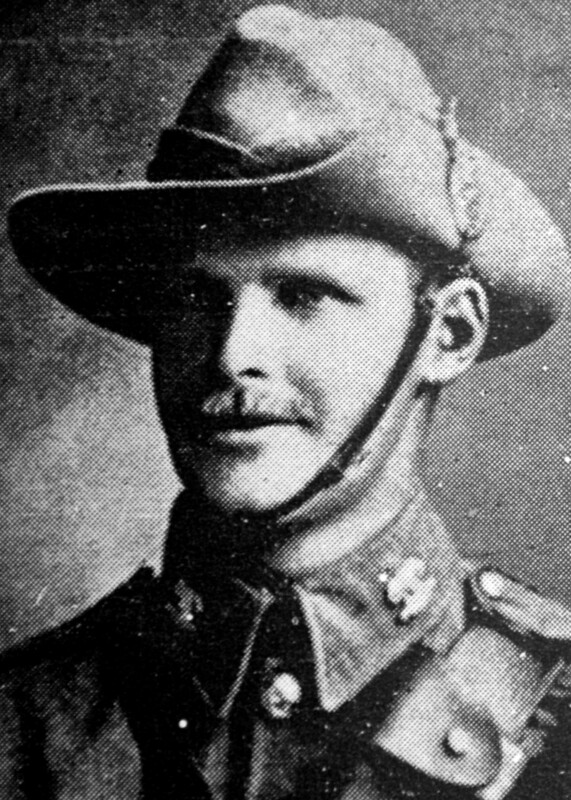 Percy Overton in the full dress uniform of an officer in the Amuri Mounted Rifles in about 1909. Credit: Christ's College Register. 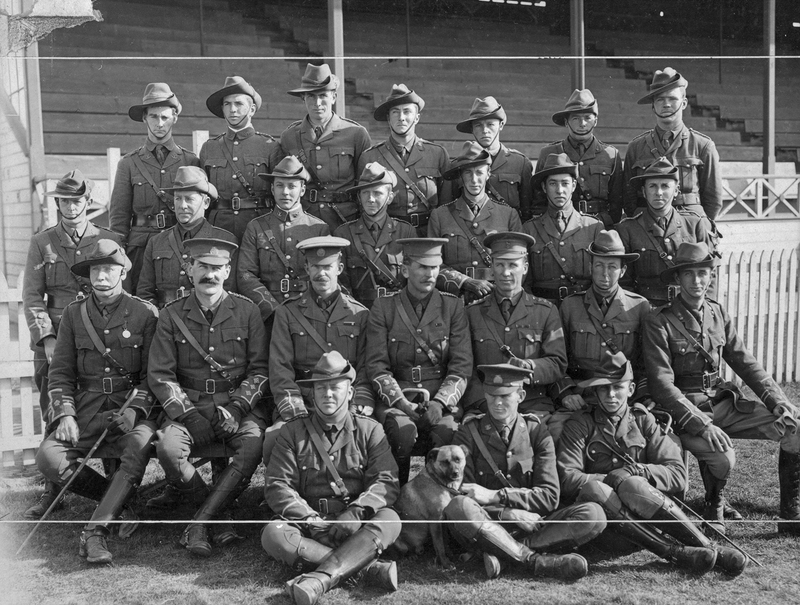 Officers of the Canterbury Mounted Rifles at Addington Camp, Christchurch. August 1914. Back row: Lieutenants L Chaytor, Taylor, Barker, W Deans, F Gorton, Hayter, D S Murchison. Second row: Lieutenant Marchant, Captain Talbot, Lieutenant Blackett, Captain Hurst, Captain Hammond, Lieutenant Free, Lieutenant Bruce. Sitting: Major Wain (O.C. 8th Sqd. ), Captain Cody (Q.M. 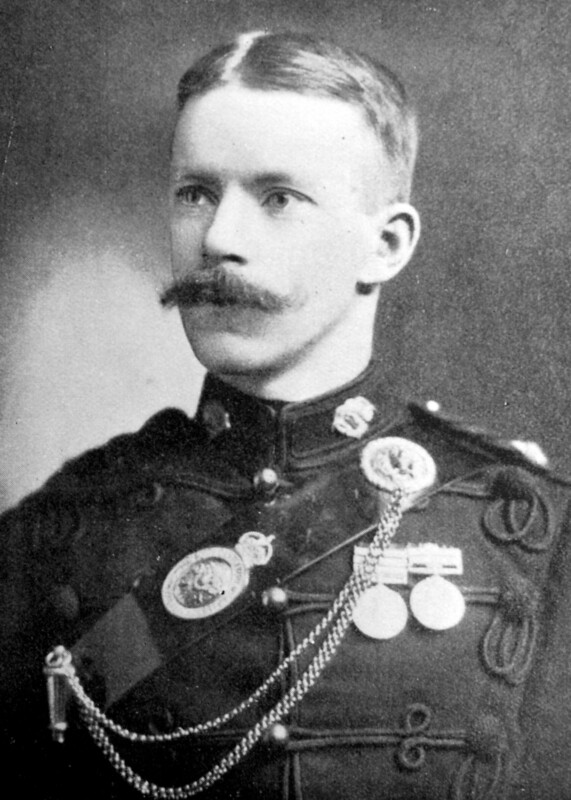 ),Major Percy Overton (2nd in Command), Lieutenant-Colonel John Findlay (1869-1946) (C.O. ), Captain Blair (Adjutant), Major Acton-Adams (O.C.1st Sqd. ), Major Hutton (O.C. 10thSqd.). Front row: Lieutenant Gibbs(Signalling Officer), Tommy the mascot, Lieutenant Davison (Machine Gun Officer), Lieutenant G Dailey. Credit: PAColl-5268-2-01, Powles Family Collection, Alexander Turnbull Library. During his scouting missions in Overton showed remarkable coolness and daring. During the mission with McInnis and Young he found what appeared to him to be a practical route leading up to Hill Q North of Chunuk Bair. The intelligence gathered by Overton played a crucial part in the planning for the Allied offensive of August 1915. In the offensive, which began on the night of 6/7 August, the New Zealand Mounted Rifles Brigade and Maori Contingent had to clear the rugged and complex ground in front of the Sari Bair range so that the Allied assault columns could attack Chunuk Bair, Hill Q and Hill 971 (Koja Cheman Tepe). Lance-Corporal Guy ‘Swannie’ Overton. Credit: Christ's College Register. History-Sheet and attestation form, Percy John Overton, NZEF personal file [PF], R21383109, Archives New Zealand, Wellington [ANZ]. Press, 22 July 1915, p.8. Terry Kinloch, Echoes of Gallipoli: In the words of New Zealand’s Mounted Riflemen, Auckland,2005, pp.211-12; Press, 22 October 1915, p.8 (quoting a letter from the Major Acton-Adams of 28 August 1915). Officers of the Regiment, The History of the Canterbury Mounted Rifles 1914-1919, Auckland, 1928, p.51. London Gazette, 5 November 1915, p.10039. Officers of the Regiment,, p.49; History-Sheet, Guy Stanley Overton PF, R21383107, ANZ. Press, 22 October 1915, 8; Poverty Bay Herald, 19 August 1915, p.4. History-sheet and attestation form, Noel Frederick Trolove, PF, R7881049, ANZ. Noel Trolove, 'Memories of Gallipoli -- August 1915', MS-Paper-10283, Alexander Turnbull Library, Wellington. Ibid., note by an unknown person.